Interested in GPS? I wrote this primer to make sure I had some notes on everything I learned when taking my first steps into the satellite World. Read this brief intro, surf some of the links on the web I've listed, and if you're still interested, I'd advise buying a copy of "GPS for Dummies" and reading that. So, what's this all about then? GPS stands for global positioning system and is a satellite driven system which can accurately tell you where you are on the earth's surface. How accurately? Well, with the most modern devices, within an accuracy of about 3 meters. The satellite system comprises 24 satellites which circle the earth, and by triangulating the distance to these satellites, can calculate your exact position. It works by receiving accurate time data from at least 4 satellites and thus computing the distance to each of these. In other words, for a GPS to work, you need to have an unobscured view of the enough of the sky to read from 4 satellites. In practice, this means not being inside a building, a car, a cave, under very dense foliage or at the bottom of a deep canyon. As well as telling you exactly where you are, a GPS can accurately measure distance, speed, direction and altitude, when biking, hiking, skiing, traveling by car, etc, etc. Some offer precise directions when driving or walking around a city. This is usually call turn-by-turn. You might want to get some more general grounding by clicking here. Measuring sports activities or orientation. To measure your bike ride or for your hiking trips, any basic GPS will do, and these start around $150. You can get progressively more features at a price, and that decision rests with how much cash you are prepared to part with for the feature set. For turn-by-turn directions, you need mapping capabilities, so be prepared to part with upwards of $1000. These devices usually bigger, have larger screens, and require software/data to run the maps, hence the price. Some small GPS devices offer mapping capabilities, which means you can (in theory) use them to give turn-by-turn directions or to read from a topo map when out in the wilds. Most expert advice suggests this is not going to replace a paper map if hiking or biking, and there may be cheaper/better ways* of getting turn-by-turn directions. In any case, you need to buy proprietary software (i.e. maps) to run these. For this reason, I went for a simple (cheap!) device which shows only data, no drawings: the Garmin Foretrex 201. * You can also buy a GPS add-on for a laptop or handheld computer. If you already have a handheld (and which self-respecting gadget freak does not? ), it might be better to buy a GPS module (either cable linked or bluetooth) and some software to run on your device. This is particularly relevant if you have a palm or pocket PC handheld or mobile phone. Your GPS may come with some proprietary software. If it has mapping features, you can buy maps and even software for turn-by-turn directions, but this is usually not cheap. You will not be able to load digital maps from other sources (e.g. a scanned image) onto your device. A 'generic' software I use is OziExplorer (an alternative is Fugawi). OziExplorer allows you to view any image (usually a digital map or an aerial photo), calibrate it with latitude and longitude points (and elevation data), add waypoints or landmarks to this image, view or measure a track you took, and link to most commercial GPS devices. From a PC or laptop, you can upload and download data to most GPS devices, and so either measure a track you took back at home, or add waypoints to you GPS device so you can find your way out in the field. You can also create fancy 3D images of these routes. You do not need a GPS to use OziExplorer, it just extends the feature set if you have one. A nice freebie is TrackAn for OziExplorer tracks. This allows you to analyse your track data in more detail than Ozi allows. Digital Maps You can purchase digital maps for many areas. In the US this is relatively inexpensive, whereas in other countries tends to by quite pricey. In Switzerland, for example, the Swiss Topo50 set for the country cost about $400. Ouch! An alternative (apart from illegal sources) is to scan a paper map. Want to create cool but very geeky 3D pictures like this one? 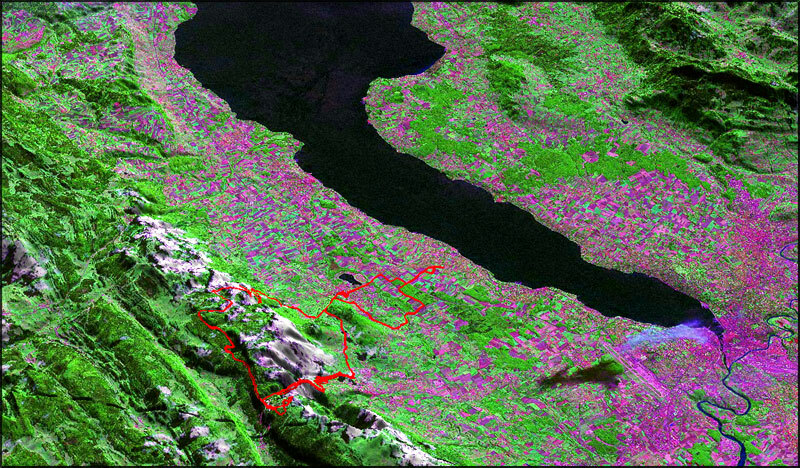 Here's how I did it... By the way, this is the Geneva basin, and the faint red line marks a bike tour into the Jura. It was made from a MrSID satellite image. A fairly powerful computer. My previous PC, a 1.8GHz, could only just handle this stuff. A map or aerial photo of your desired area. An accurate link between this picture and latitude/longitude coordinates. Some 3D data of your mapped area. 1. Scan a paper topo map or download a digital map, aerial photo or satellite photo from the web. You need a picture that represents your area of interest, but it doesn't really matter whether you choose maps or photos. Scale is not important, but you need to recognise local features. Scanning - use approx. 150 dpi and 256 colours. You won't need more resolution. Save the picture in a loss-less format such as bitmap (.bmp). Aerial or satellite photos can be obtained from a number of sources on the web, but NASA's MrSID project is a particularly good free source of hi-res satellite photos. Each single map is a large download (about 200MB+) but covers a large enough area for any individual. In my case, the map was almost all of the Alps including the whole of Switzerland and a large chunk of Southern Germany. Also, the data has been geofixed, so you can skip the map calibration (see below). The only downside is the ugly purple tinge in a lot of areas - I'm working on a fix for this. Terraserver also has some nice pictures but they ain't free. In fact, they ain't even cheap. An even better source now is Google Earth which does all the hard work for you by finding the best images for you. 2. Get OziExplorer. This software allows an image file (e.g. a scanned map) to be linked to latitude and longitude coordinates. It also has a load of other features like measuring distances, plotting routes, showing waypoints and linking to your GPS device. Alternative products include Fugawi or Topofusion. Using OziExplorer is pretty intuitive, but requires a little patience at first. There is a useful user-group on yahoo for Q&A's. 3. Get OziExplorer 3D - this is an add-on to OziExplorer which displays your maps in 3D. This requires global 3D data (DEM) to work. 3DEM is a freeware version of the same, but is slightly more difficult to use as it is not integrated with OziExplorer. 4. DEM data - can be downloaded for the whole globe here. Just click on your area of the World. Each dataset is one degree of latitude/longitude - for example Geneva is in 46N, 6E (which extends to 47N, 7E). This data has 90m accuracy (one pixel is 90M²) and is the best source for global data. However, your particular spot on the World might have better data (e.g. the USA) so it's worth looking around. VTerrain has a list of DEM datasets and explains the subject well. If you don't know where you are on the World map, the Degree Confluence Project is an easy place to find out. Or just read the map reference on any decent local map. 5. Clean the DEM data. The raw DEM data may contain blanks or missing data, which will disrupt the look of your 3D maps. Run SRTMFill on your downloaded data to clean it. It comes with help files and is pretty straight forward. TIP: download and clean all the data (steps 4 and 5) you are likely to need as you only need to do this once. I took the whole of Switzerland plus some of the surrounding areas which was about ten grid squares, or ten sets of data. 6. Start up OziExplorer. You should spend some time playing with this first before you start making 3D pictures. You first need to load the (clean) DEM data by telling OziExplorer where you keep your DEM data and what type it is (see OziExplorer help files). Load a map (or picture) and calibrate it in OziExplorer. This simply means telling OziExplorer what the map coordinates of 4 points in the real world are on your scanned paper map or digital map. Once calibrated, you know if you got the 3D data sorted out as moving your mouse across the map will display both lat/long coordinates and altitude. I used SwissTopo maps which use the Swiss grid, and wasted a lot of time trying to calibrate OziExplorer using the Swiss grid coordinates, until I worked out the right nomenclature. You add three zeros to the Swiss grid reference so, for example, grid reference 118N 500E (Geneva) should be entered as 118000 500000. Converting would have been easier if I had known about this site. If you want waypoints or a route to be displayed, you will have to enter them by hand in OziExplorer or load them from saved files at this point. There are lots of waypoints available on the web, but wahoo is a good starting point. Open the 3D window in OziExplorer, select an area to map and press go! If you're playing with this for the first time, I would recommend taking a small area at low resolution and plotting this. This will make a half-decent picture which you can manipulate easily. Depending on your PC's computing power, you can increase the size of the picture or the resolution of the 3D model until you reach the point where your PC can't handle the number crunching. With a smaller 3D model, you will be able to play with the lighting and fog and different 3D views and settings to learn what these do in real time, without the frustration of waiting for you PC to calculate each change. OziExplorer is really a GPS tool, and not just a toy for fancy 3D gimmicks. These pictures are baby steps, my first laboured attempts at 3D imaging. I'm still learning about better data sources and improved 3D rendering which might make these drawings more photo-realistic in the near future.